It has been eleven months since Part 10 of this series was published. Don't worry, I won't wait twelve months for Part 12 just to arbitrarily match the months elapsed with the article number. This time around retranslations and translation commentary have been provided by hitoshura, beloved veteran of TLS and of the Final Fantasy community. We all deeply thank him for his services. is the penultimate section that highlights the scenario with Reno and the Underwater Reactor that calls for expansion. I definitely didn't know about this. That video highlights half of the fun when I was drawing the line between used and unused text: You get to discover so much used text that you would never have known about without the help of Text Viewing/Editing software. I tried really hard to find that obscure Forgotten City scene in the Ultimania Omega, but so far I haven't found it. Do correct me if the scene is detailed in there, or in any other FFVII guide book for that matter. EDIT: The article now reads correctly the exact interval in which the aforementioned elusive scene is available. How similar is this to the word translated as flunkies? It's a different word. This one ("zako") literally means "small fish," and is used to refer to generic enemies (i.e. lackeys) in video games. "Flunkies" was "bunshin" (&#20998;&#36523 , which you may recognize from the Japanese name of the Shadow Clone Technique in "Naruto." This word is basically "doppelganger." I want to thank the people of the Site Design thread for unintentionally making me motivated to complete Part 11. The new frontpage design inspired me and brought to my attention that Part 10 was published on August 1, 2015. I felt then that the time was right for me to muster some passion and get Part 11 online before a full year had passed. On most days of the year, just the mere thought of the original FFVII makes me groan and twist internally in pain. I spent too much time with this game, digging into it, picking it apart, analyzing and obsessing over it... My FFVII gland can only produce feel-good chemicals for the game a few days every year. While the FFVII remake trailers can stir a decent amount of nostalgic inspiration, even my feelings for the remake are tainted by my fatigue with the original game. I am. Just. So. Damn. Tired. In contrast, I associate Dirge of Cerberus and Crisis Core with way more fun and enjoyment because those titles still hold plenty of novelty, mystery and discovery to them when doing research. My joy in playing these games haven't been destroyed...yet. I promise to deliver Part 12 of the Unused Text series within a year from now but beyond that I make no promises. The features that would technically remain after Part 12 would be Debug Room examinations, unused menu text, the little unused material there is on the World Map and a few File Documentation appendices. However it feels important for my mental health that I don't promise to ever deliver these articles. I desire to have a clean conscience on matter, instead of going years with a bad conscience like I have done with the numbered Unused Text articles, knowing that fans want the full dissection but that I only rarely can muster the passion to deliver. Wouldn't it be funny if my choice to not make a promise would end up making it easier for me to complete articles? No point in doing something you don't get some enjoyment out of. If it can be fun for you to do it again, you'll get the itch to do more at some point -- and if you never do, that's no big deal. These articles are such a treat and one of the main reasons I frequent the site now and then. Keep up the work Shademp, hope the next part comes out sooner! 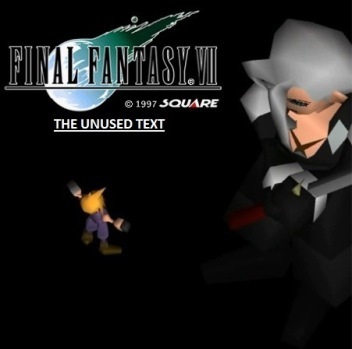 Only just now realized how dull and boring the current "logo" image of the Unused Text Series was. Then again I did make it back in 2011-2012, when I knew next to nothing of picture and text editing. The above image was previously placed beneath the links to the numbered UT articles on the index page. The current experimental logo is this one. This image has now replaced the old logo of the UT index page. If somebody wants to experiment with other variations of this logo, let me know (either on this thread or via PM). One detail that bothers me is that I haven't found an effective way to decrease the height of a font without also decreasing the width. One way is to change the text into a Smart Object and then Transform the height of the text (which now acts as an image) but this naturally leads to some ugly pixelations. If somebody knows of a way for me to decrease *only* the height of the text, without decreasing the quality of the letters and the effects, please let me know. EDIT: Changed the logo so that the black stroke around letters were 2 pixels wide instead of only 1 pixel wide. In the previous version, the letters in "UNUSED" were harder to make out due to not contrasting enough with the background. EDIT#2: Third version, where I did go the route of making the subtitle shorter in height. Alright, I *think* I'm satisifed now... This version is now used for the UT index. I'm really digging the second one with the taller subtitle and thicker strokes. I mean, Cloud says "So let Barret and his buddies do something about it," to Tifa, could that be the line you're thinking of? I think its a woman who complains about suspicious activity at the bar, and a smell of gunpowder. "It's about Tifa's store, Seventh Heaven. Barret and his 3 flunkies are known for this. It happens from time to time. All of a sudden they'd throw out all of the confused customers. It's pretty suspicious. There's this smell of gunpowder. It's dangerous. They must be up to something really bad." That one was just "Barret" with the pluralizing suffix "-tachi" attached.